With thanks to Barbara and Allen Chapman for sending the scan. This is a photo of the whole Monkhouse family outside the house on Tetley Row. 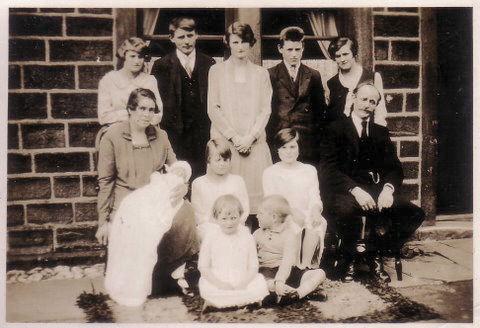 Taken in 1928 on the occasion of the Christening of Isaac and Elizabeth Monkhouse's youngest and last son Jacob. This is the only photo of the whole family together. Back Row: Mary (My Mum), Bill, Maggie, Tom and Annie. Middle Row: Lizzie Monkhouse holding Jacob, Nora, Alice and Ike Monkhouse. Front row: Rose and Len.